Together, we can start a sea of change. We are all connected to the ocean. And we're all responsible for the trash we leave behind, whether we mean to or not. Please join us, and the global movement that is giving back to the ocean, by spending just one day cleaning up trash from our world's waterways and ocean. It's one of the easiest things we can do to help protect the ocean. 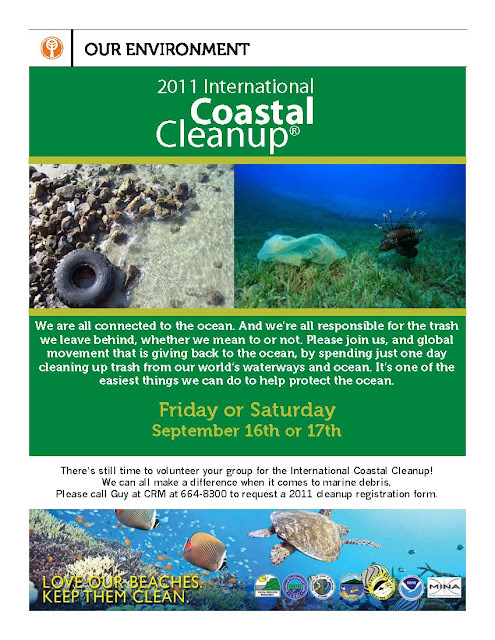 We invite you to join us on Friday, September 16 and Saturday, September 17 - from 8 a.m. to 12 p.m. for the 2011 International Coastal Cleanup. CRM along with DEQ will retrieve and properly dispose of the trash and recycling collected from the cleanup on Saipan. We will coordinate with your organization/group to determine a pick up point. Thank you for your kind consideration of this important CNMI-wide event.